The men's and women's world series finished in stunning fashion at the HSBC Paris Sevens, with three days of incredible rugby sevens. 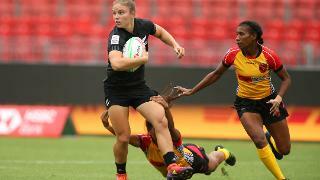 The women's competition kicked off on Friday and finished on Sunday afternoon with what turned out to be a one-sided final between New Zealand and Australia, who were crowned series champions after finishing two points ahead of the Black Ferns. Michaela Blyde and Portia Woodman scored two tries apiece in the final in their side's 33-7 win, but it was captain and try scorer Sarah Goss who was named HSBC Player of the Final. "It was amazing to get the win, especially with the Rugby World Cup Sevens coming up, we knew we had to keep momentum up," said Goss. "After Langford we knew we were playing well and i am just so proud of how we went here in Paris. In the men's competition, it was head-to-head between South Africa and Fiji going into the final round of the series and went down to the wire after Fiji finished fifth overall in Paris. South Africa met England in the final, with only a win being enough to take the series. Despite England's best efforts, the Blitzboks became back-to-back series champions after taking a 24-14 victory. One of the try scorers was Dewald Human, who has played just 11 games of sevens in the 2018 world series and is a bright future prospect for South Africa. Human was named HSBC Player of the Final after scoring and helping set up another try. "It's such a privilege to follow in the footsteps of players like Cecil Afrika and Branco du Preez," said Human. "Coach told me to just back myself and play my own game and now we have the win so it was an incredible experience for all of us."